Former Minnesota Gov. 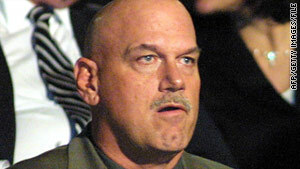 Jesse Ventura alleges enhanced airport security procedures violate his rights. (CNN) -- Count Jesse Ventura among fliers who don't want their "junk" touched by Transportation Security Administration agents. The suit alleges enhanced airport security procedures, including pat-downs and full body scanning, violate Ventura's rights under the Fourth Amendment, which protects Americans from unreasonable searches and seizures. Ventura is not seeking monetary damages, according to his attorney, David Olsen. Ventura wants an acknowledgment from the court that his rights have been violated and a court order that would stop the government from subjecting him to the screening procedures, Olsen said. "We consider the pat-downs and the whole body scanners to be a step too far, and they have crossed into the realm of the unreasonable," Olsen said. The TSA said it cannot comment on pending litigation, but it has characterized pat-downs as one of multiple layers of security used to protect the traveling public. "Pat-downs are one important tool to help TSA detect hidden and dangerous items such as explosives," the agency said on its website. The lawsuit calls the TSA's enhanced pat-downs "warrantless, non-suspicion-based offensive touching, gripping and rubbing of the genital and other sensitive areas of the body." Ventura had hip replacement surgery in 2008, and the resulting titanium implant routinely sets off metal detectors, requiring him to undergo pat-down searches, according to court documents. The lawsuit alleges the pat-downs and the TSA's whole body imaging procedures meet legal definitions of unlawful sexual assault and unlawful video voyeurism. Ventura has stopped flying commercially to avoid the screening, Olsen said. "It virtually makes it impossible for him to work in his present job," he said.